This is almost a holy grail trading system. I have tested this strategy for some time now and I found this strategy can give you at least 80% accuracy. Let me introduce my Crude Oil scalping system with Parabolic SAR indicator for at least 20 points profits per day. What is a scalping trading system? A scalping trading system involves quickly entering trades and quich booking of profits. Its mainly an intraday trading system where you keep small target and small stop loss. Who is a good broker for Crude oil scalping? You need to choose a suitable broker. 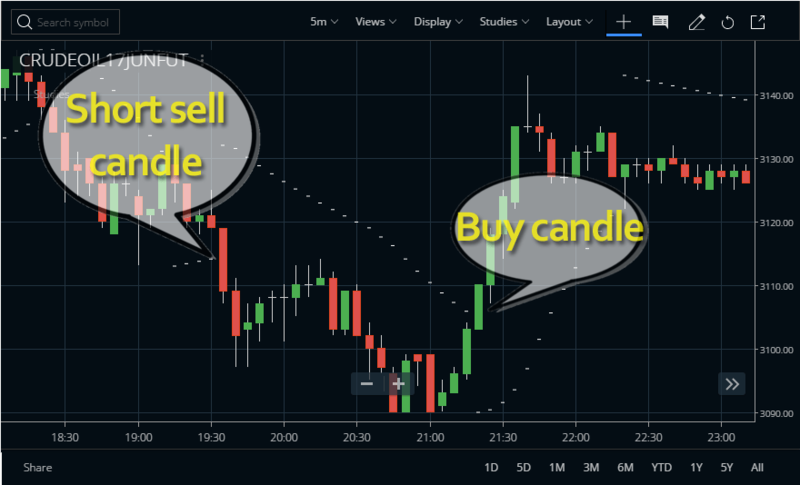 As this strategy involves small target and small stop loss and you need to trade multiple times a day for quick gains the brokerage should be very competitive. I shall suggest you to open a trading account with Zerodha as their brokerage is most competitive. Check this tool: Zerodha Brokerage Calculator. Open a 5 minutes chart of MCX crude oil and attach Parabolic SAR indicator OR PSAR (0.02, 0.2). This will create crude oil ctart with PSAR. This is our basic setup for Crude Oil scalping. 1) Parabolic SAR indicator should be below price candle. 2) Wait for a candle whose open and low are same. This will be our entry candle. 3) Note the high of that entry candle. 4) Put a limit buy order in the terminal above the high of the entry candle. 5) Once the order is filled keep a stop loss below low of the entry candle. 6) Keep a target same as stop loss points OR 5 points whichever is greater, i.e if the stop loss is 3 points keep a target of 5 points but if the stop loss is 8 points then keep a target of 8 points. 7) Cancel the order if entry candle low get broken before triggering the buy. 1) Parabolic SAR indicator should be above price candle. 2) Wait for a candle whose open and high are same. This will be our entry candle. 3) Note the low of that entry candle. 4) Put a limit short sell order in the terminal below the low of the entry candle. 5) Once the order is filled keep a stop loss above high of the entry candle. 6) Keep a target same as stop loss points OR 5 points whichever is greater. 7) Cancel the order if entry candle high get broken before triggering the short sell. This strategy works great for Crude Oil scalping and you can get 4-5 trades a day which can fetch you 20-30 points every day. Your observations will be welcome in the comment box below. My query is regarding the point no.2 of entry conditions. Is it necessary that the condition 2 should be the same bar while it crosses the PSAR? or suppose the current bar has the different OHLC and it crosses the PSAR and after couple of bars we get the open & Low same, so should we enter when the high of that bar is breached? Kaushal, both criteria at same bar does not needed. First criteria the parabolic SAR should be below price bar for a buy and then wait for a open low same bar which will be the trigger bar. Look for the opposite for a sell order. Can you help us making an AFL on this? Ok Kaushal, its not that difficult. You can try yourself too. If I can manage time, definitely I will try to post an afl out of it. I know the basic coding, and have tried doing it. Problem area is i am not abe to code “the entry bar where the high of the OPEN=LOW candle breached”. There can be n number of bars passed untill it breaks the high point of the open=low candle. what my coding does is, it sees the previous candle for the open=low condition. **the example abv was for the buy condition. Kaushal, you can define a buy level and short sell level. what we require is Barsince the both conditions have met (and till it is true), it has to find a candle where the high is higher than buycandle condition. Kaushal, I am unable to understand what exactly are you meaning. But if you get the clear buy and sell levels, you can easily create a trading system. If you wish you can use exrem and barsince functions. Nope, this was for Amibroker. But this is a simple formula. You can develop it as a Zerodha Pi scanner. Nitesh, candle size is not a factor. The criteria should be open = low OR open = high. The lower the candle size the lower your risk and stop loss. For coding on Pi you can check my post on Zerodha Pi scanner. Best time is when you get a candle with OL or OH same with Parabolic SAR supporting the direction. You need to be patient. Please can you make a video. ?